Need a lifting bow shackle with an extra safe closing mechanism? Try our safety bolt alloy bow shackle. 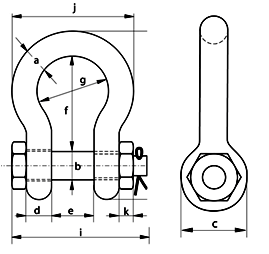 The retaining split pin which is inserted right through the bolt ensures the pin cannot come out until manually removed. This makes them perfect for high vibration areas or where there could be friction on the pin. 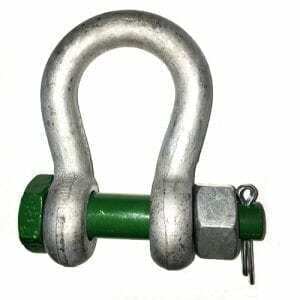 Having one of the highest specs from our large range of lifting shackles these are also called green pin type shackles and are manufactured from high tensile steel at grade 6. Having also been quenched and tempered with a hot dip galvanized finish the wide range of temperatures where they can be safely used is impressive. In fact the range runs from minus 20 C right up to plus 200 C.
The safety bolt alloy bow shackle meets fed spec RRC271 standards and also EN13889 so quality is ensured. We have this type of alloy bow shackle available with working load limits from 0.5 tonne up to 85 tonne with incremental dimensions to suit. The table below will tell you more details. We can also supply these in the Dee shackle type format. 01384 78004 is our phone number should you wish to call us. Emailing us can be done in one of 2 ways; either via the rapid enquiry form or the contact us page. Placing an order couldn’t be easier, a member of our team will take your order details and payment, the order is processed quickly and you should receive your products within a few days, sometimes next day. Safety Bolt Alloy Bow Shackle Overall rating: 5 out of 5 based on 6 reviews.